Continuing our journey of Blantyre homes that are no longer there, we arrive now in High Blantyre. 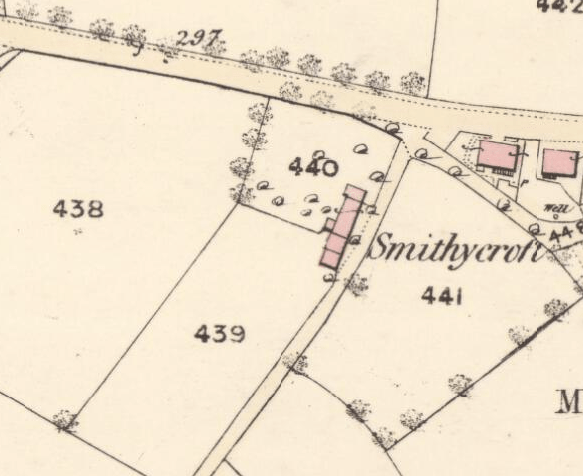 Smithycroft, was a small croft holding, directly opposite Archers Croft field. The Smithycroft was situated on Craigmuir Road, High Blantyre. The house is pictured on the 1859 map. It was occupied by a blacksmith and a few labourers. A Smithy (wood store) was located at the Southern side. Smithycroft was built in 1777 and in 1885 the High Blantyre Train Station opened. The Station itself was immediately beside the Smithy. Smithycroft is shown still on 1958 maps but the exact date the building was demolished is unknown, but may have been around that post WW2 era. There’s an amazing couple of early 20th century photographs that show Smithycroft and the construction dating evidence is inscribed into the lintols. By courtesy and thanks to Alex Rochead, these pristene and very old photos are shown below. Since Alex provided the Smithycroft photo, i have been able to solve a mystery puzzling me for some time. IN the grounds of Blantyre Old Parish Church, there’s a kerbstone dated 1777. This is clearly the lintol from Smithycroft, salvaged in WW2 era and placed in the ground only a matter of yards away in the church grounds! Today, there is a modern housing estate on the fields of Smithycroft.